I was asked by author Dane Cobain to review this book called Subject Verb Object. 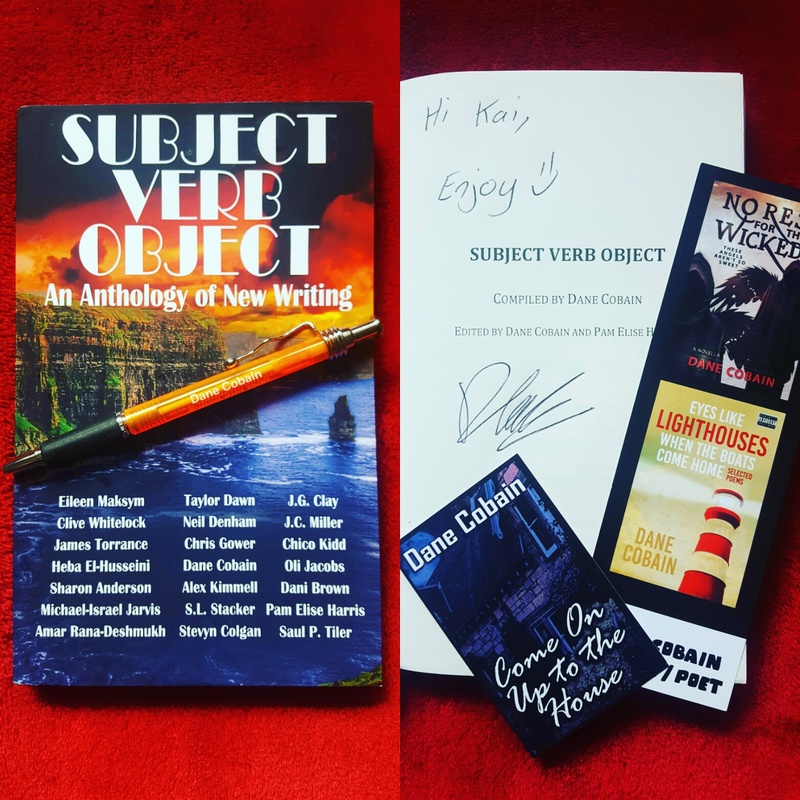 Subject Verb Object is a self-proclaimed "Anthology of New Writing". It is a collection of short stories and poems from 18 different new-style authors. The whole concept and idea of this book is a format that I've found myself to love. Each of the included writers was asked to submit a short writing prompt which included a Subject, a verb and an object (e.g. Philip picked up the magnifying glass). These prompts were then shuffled and randomly assigned to the writers who were then tasked with creating a short piece of writing based on that prompt. The pieces in this anthology range from love to tragedy, mystery to discovery. Here are a few of the stories I enjoyed the most. One of my favourites came from co-editor Dane Cobain. One of the first things I enjoyed whilst reading this was how literal Cobain took the prompt. A few of the authors use the prompt as a kind of metaphor for their writing which can be fun to try and figure out how the story stems from it but can also prove to be frustrating. Cobain's story, on the other hand, simply includes a character named Jay and a Mirror. Simple. This passage follows therapist Jay's struggle with spectrophobia, a disappearance and "the weirdness". This short story is probably my favourite out of the whole anthology. If I had to write my own blurb for this entry I'd put "A mysterious sci-fi entry, taking a real life event and adding their own twist on it. The Judgement Of Little Bug follows "The Watchers" as they observe humans developing through time until they do something they never thought any form of life would be capable of". I'm a big fan of sci-fi media so this story was immediately a hit for me. Add that to the excellent writing style of Eileen Maksym, the speed that the story takes is ideal to follow, and I would be interested in reading a novelized version of this concept. Come on Eileen, give the people what they want! My third and final favourite entry into this anthology is Tom Ate The Cheese. First impressions of the title and prompt made me think "oh, this will just be a silly, comical story" but I was wrong. Without giving too much away, a 3 word summary of this story would be regret, conflict and decision. Such an eye opening piece about how the wrong decision can greatly affect your life. I wouldn't want to say much more because this is one of the shortest stories in the book but one of the best. So would I recommend this book? Yes, without a doubt. It's great for both major and casual readers alike. With a whole range of writing styles and topics, you are bound to find a few that you just adore. A lot of these stories I would love to see made into a full novel. Especially The Judgement of Little Bug. If you read it, come back and let me know your favourites.